RED BANK, NJ (June 24, 2016)—SmartCEO selected Towne and Country Management principals Lisa Vitiello and Ginger Pitaccio as recipients for the 2016 Brava Awards. The business leaders were honored at a reception on June 23 at the Marquis in Old Bridge, the first ever SmartCEO reception to be held in New Jersey. 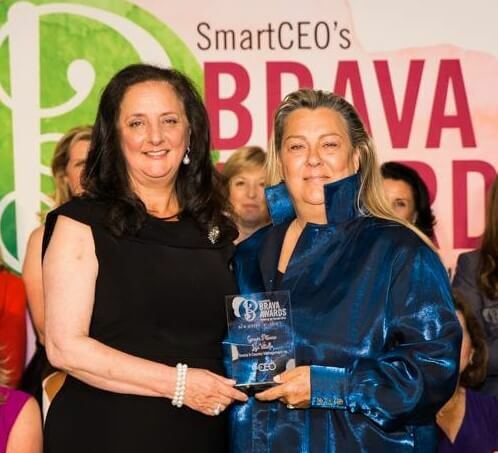 SmartCEO, a print and digital business publication, has been presenting the Brava Awards to an elite cadre of female business leaders since 2008. This year, 50 women were chosen out of approximately 400 nominations. The Brava Awards program celebrates high-impact female business leaders in three categories: CEOs, Executive Directors of Nonprofits, and other “C-suite” executives. “Ginger and Lisa have demonstrated an extraordinary ability to run a successful business through tough times…and have given back to the community with pro-bono tax help and other assistance for elderly residents.” says SmartCEO’s Program Manager Abbey Bricker. Clients also heap on the praise for Towne and Country principals: “When I think of Lisa or Ginger, or T&C as a whole, I immediately think: dependable, family/community-oriented, reliable, straightforward, confident, experienced and compassionate in their dealings with the [residential community board of directors], community and our vendors.,” enthuses Joanne Bellucci-Celentano, a former board member and resident of a community managed by Towne and Country. “They are consistently ready, willing and able to take on any task – no matter how small or large/time consuming – and are always looking to go above and beyond those they provide a service. Wilkin & Guttenplan PC, one of the accounting firms with which Towne and Country works, officially nominated Vitiello and Pitaccio for the award, and Principal Carol Koransky is pleased to congratulate them on their selection. SmartCEO will be publishing profiles of each winner in the July/August issue of SmartCEO’s magazine.